A gas bomb on board a flight from Spain to New York threatens to asphyxiate all the passengers. As the back projected clouds float past, the cast get on with the business of holding their breath and praying for a miracle. 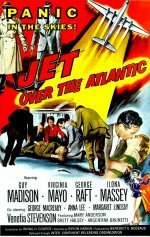 Their unlikely saviour turns out to be convicted murderer (Guy Madison) a former pilot, who is in the custody of FBI agent George Raft. Also on board is reptilian George Macready as an English nobleman. Not as much fun as Airplane! or even Airport but Madison does his heroic best.